The second annual “Catch the King” event—when trained volunteers hit the shores of Hampton Roads to map the reach of one of the year’s highest astronomical tides—will take place this Saturday morning, October 27th. The event—brainchild of former Virginian-Pilot reporter Dave Mayfield, Skip Stiles of local non-profit Wetlands Watch, and Dr. Derek Loftis of the Virginia Institute of Marine Science—is designed to raise awareness of coastal flooding and sea-level rise by giving participants a firsthand look at a troubling reality: in just 50 years, regular high tides will be as high as today’s annual “king tides,” while king tides will reach heights now only seen during storms. The event also provides a wealth of water-level data that Loftis uses to improve VIMS’ street-level inundation model, a computer simulation that builds on data from a network of water-level sensors to predict the time and place of coastal flooding throughout Hampton Roads—from the broad shorelines of the Chesapeake Bay to the narrowest tidal creeks. Participation in the event is just one part of VIMS’ institute-wide effort to help Virginia and other coastal areas become more resilient to coastal flooding and sea-level rise. “Catch the King” participants gather their data using the free “Sea Level Rise” app developed by Stiles in conjunction with Norfolk-based software development company Concursive. The app now includes changes suggested by Loftis and Norfolk’s Deputy Resilience Officer Kyle Spencer that help scientists better interpret the data provided by volunteers during flood events. With phones in hand, these “king’s attendants” walk along the water line near peak tide, thumbing a “GPS pin” every few strides to mark the extent of tidal inundation. One such model-validation hot spot is what Loftis calls an “artificial digital dam.” These occur where LIDAR-based data show the local elevation as the pavement level of a bridge—rather than the river, creek, or culvert underlying that surface. If not corrected, these features will prevent the model from extending floodwaters upstream of the perceived obstruction, thus greatly underestimating the actual extent of inundation. 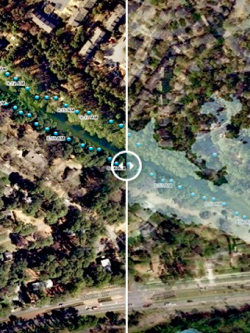 “Ground-truthing” by Catch the King volunteers can rectify the sometimes large discrepancies occasioned by these virtual features; mapping the upstream flood extent is thus a focus area for this year's volunteer participants. This year, WHRO is focusing its outreach efforts on schools, with more than 120 elementary, middle, and high schools having chosen Catch the King as their science class project. The event touches on six major SOLs, including physics, geometry, chemistry, and water quality. Although registration to participate in this year’s Catch the King event is now closed, the Sea Level Rise app is available at any time through Apple’s App Store and Google Play, and training sessions will continue to prepare users for future high-tide and storm events. Supporting the Catch the King event is the Commonwealth Center for Recurrent Flooding Resiliency, a partnership between VIMS, Old Dominion University, and the Virginia Coastal Policy Center at W&M Law School. Other sponsors include the Batten Environmental Education Initiative, the Hampton Roads Community Foundation, the Hampton Roads Sanitation District, and tHRive, the young professionals of the Hampton Roads Chamber.